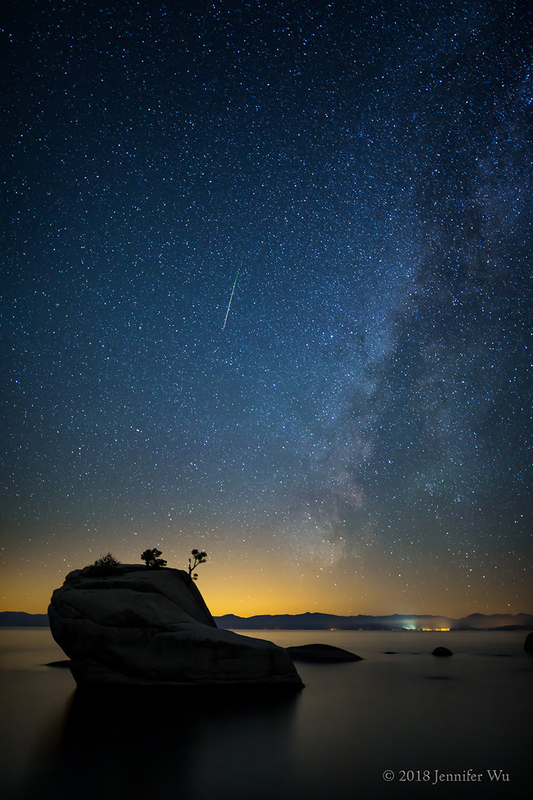 Shooting Star Over Lake Tahoe – Photographed at f/1.4, 20 seconds, ISO 1250, EF 24mm f/1.4L II USM, Canon EOS 5D Mark II. What Creates a Meteor Shower? Shooting Star and Boulders – I like the warm glow along the horizon created from the city lights of the Sacramento Valley. Photographed at f/1.4, 20 seconds, ISO 3200, EF 24mm f/1.4L II USM, Canon EOS-1D X. In this article I will provide tips on how to photograph meteors based on my experience so that you can learn from my mistakes. I find it disappointing when going out to photograph meteors to find visibility reduced due to thin cloud cover or other factors. It is possible to see meteors on any night with ideal viewing conditions. 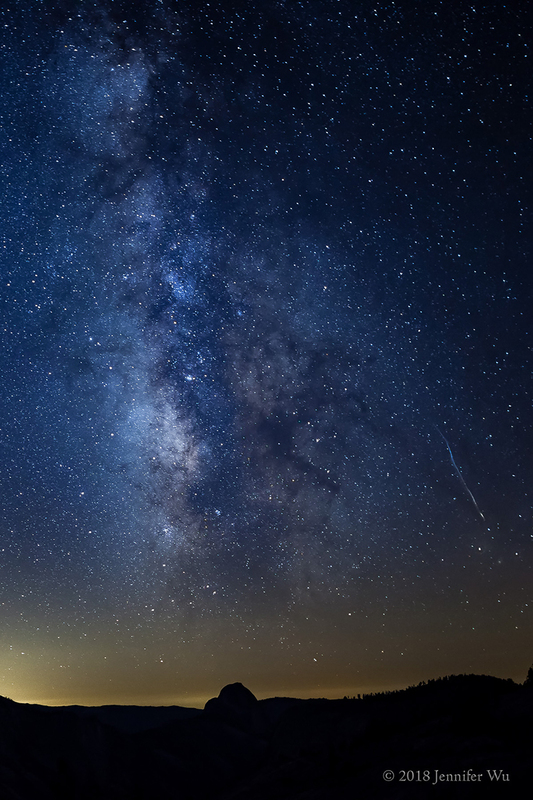 Atmospheric conditions including light pollution, weather and the phase of the moon determine meteor visibility so here are some things to consider. For the best viewing opportunities, you’ll need to get away from the light pollution found in larger towns and cities. I like driving a couple of hours outside of city lights. Use the Light Pollution Map to locate dark skies—avoid red, orange and yellow areas and look for gray, blue or green areas. I find these provide dark skies. Distant city lights provide a warm, sunset-like glow along the horizon. Plan on photographing in the direction of a city for the warm glow or away from it for darker skies, depending on your preference. Clear skies with low humidity, low dust and few clouds improve meteor visibility. For your area, you can check for cloud cover monthly averages at Weather Spark. For cloud cover predictions for the next 24-48 hours at Clear Sky Chart (my favorite) or a map view at 7Timer!, click on weather chart, desired map and cloud cover. Photographing near the new moon phase, when no moon is visible in the sky, allows for dark sky conditions and more visible stars. The bright meteors will be even more spectacular and dim meteors will be photographable. Based on my experience photographing meteors, I recommend shooting within a week before or after a new moon for dark skies and bright meteors. The half-moon will supply bright light on the landscape and work relatively well but is not ideal. Avoid the light of the three-quarter moon or the full moon, as it is very disappointing. Look up the phase of the moon using the resources listed at the end of this article. 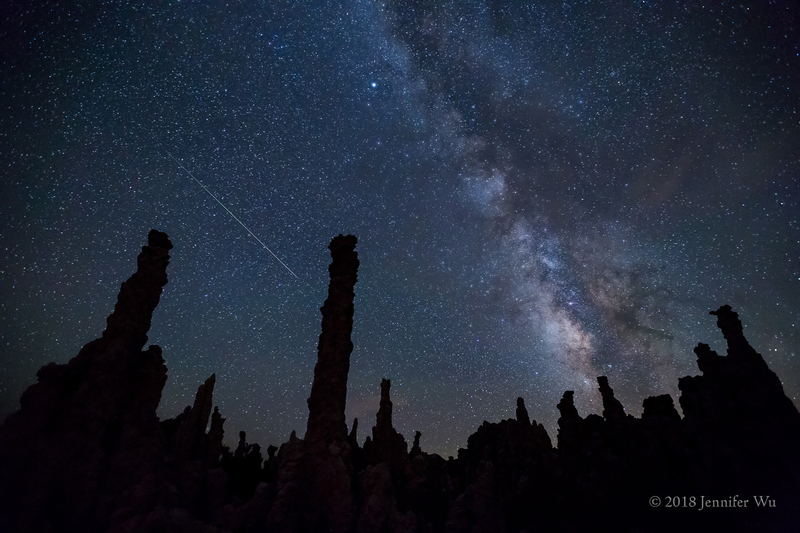 Falling Star and Tufa – I placed the tufa in the foreground of the night sky and Milky Way and waited for a falling star. Photographed at Mono Lake, California at f/2.8, 25 seconds, ISO 6400, EF 16-35mm f/2.8L II USM at 16mm, Canon EOS 5D Mark III. Photographing meteors is very much the same as photographing the stars as points of light and the Milky Way. For settings and equipment, please first read my article Photographing the Milky Way and Night Sky and use the camera settings checklist. 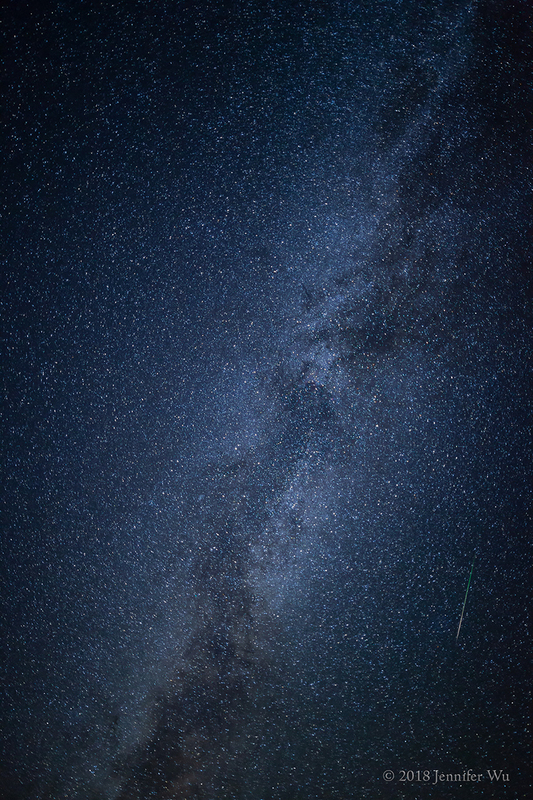 Read the section on when to photograph the Milky Way to apply it to your meteor shots. The shutter speeds of 15-30 seconds are good for meteors. I discovered longer exposure times of a few minutes, like with star trails, meteors become dim or invisible. Meteors start as green, turn yellow and end in red, but the red can appear white due to overexposure. I noticed I could underexpose the night sky to get better color in a meteor but I did not like that the night sky and dim meteors were underexposed. If you do this, take a base layer image with a good exposure of the stars, twilight or both. Then use Photoshop® as described later in this article to composite a properly exposed base layer of the stars with the underexposed meteor layer. Turn off LENR. In my testing, it does very little for a 30-second exposure to reduce the digital noise but works well with longer exposures. Using LENR will double the time of your exposure since it uses a second exposure to determine the fixed-pattern noise to subtract from the actual exposure. Turning it off will double your chances of photographing a meteor. I made the mistake of leaving it on when photographing a meteor shower and I missed some good meteor shots. A Little Shooting Star – Meteors can be large or small, dim or bright. This meteor is bright, yet small and close to the horizon. Photographed at f/1.4, 20 seconds, ISO 2000, EF 24mm f/1.4L II USM, Canon EOS 5D Mark II. 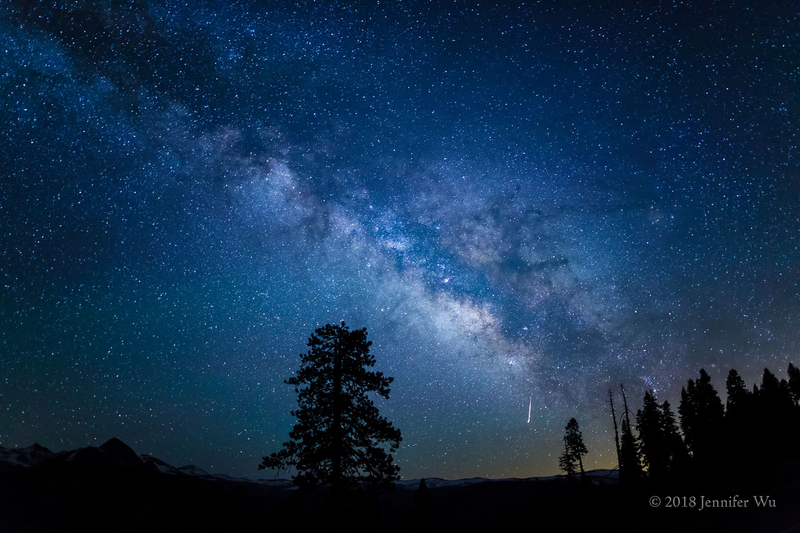 Wide-angle lenses are perfect for a broad area of view to capture a meteor. I use from 14mm to 35mm depending on the composition for the scene. Using an ultra wide-angle lens like a 14mm versus a 24mm will allow for a broader area of coverage and more likeliness of including a meteor in your frame. However, the meteor will appear smaller in the frame so use your best judgment given your scene. I have some beautiful but flawed meteor photos because they have a poor composition due to the meteor’s positioning within the frame. To increase your chances of getting a meteor composition you are happy with, set up your camera to do time-lapse and take photographs continuously over a period of time, such as a few hours. A time-lapse will have hundreds of frames to choose from and increase your chances that any given meteor, or many, will be well-placed in the frame. Once I figured this out, I almost always set up a time-lapse when photographing meteors. For additional information on how to do time-lapse, see my article on Photographing the Milky Way, and look out for my upcoming article on Night Sky Time-lapse. Exploding Meteor – While photographing a meteor, it exploded. When I went to check it out on the LCD screen on the back of the camera, there was a curvy smoky trail in the sky! This is the only time I have ever seen this happen. Photographed at f/1.4, 20 seconds, ISO 1600, EF 24mm f/1.4L II USM, Canon EOS 5D Mark II. You can improve your odds of catching a shooting star with a little planning. An average night can have up to several meteors per hour, however the best time to capture meteor shots is during a meteor shower. There is often increased activity of meteors several days before the peak night of the meteor shower. In my experience, that can be a good time to photograph as well. The Milky Way and Shooting Star - Looking directly up at the night sky. Photographed at f/1.4, 20 seconds, ISO 3200, EF 24mm f/1.4L II USM, Canon EOS 5D Mark II. *The peak night can be off by a day or two depending on the year, check EarthSky. **The per hour meteor listing only refers to the peak hour and not the hours before or after that hour. I see fewer meteors per hour than listed on the peak hour because some meteors are too faint to see and I am not looking 180 degrees. I get about two-dozen meteor photographs in a night of shooting with high rate meteor showers and good viewing conditions. When looking for meteor showers to photograph, I first check for a high hourly peak rate. I then check the phase of the moon, looking for a shower near the new moon. Every year the moon phase will be different for each annual meteor shower. 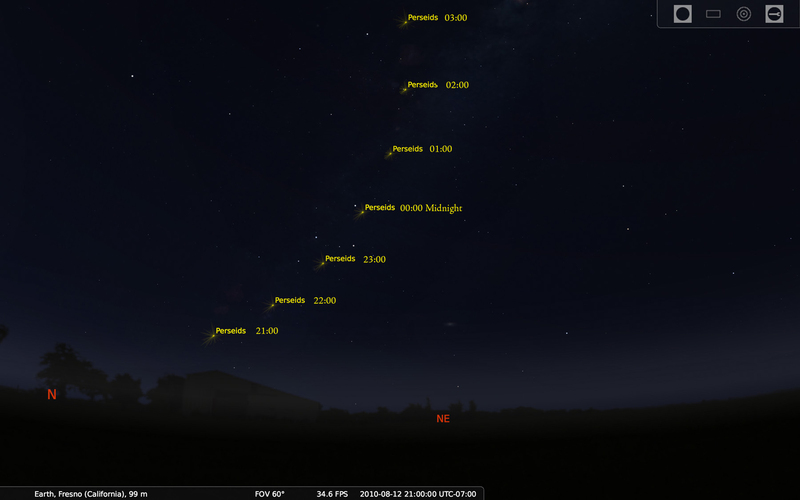 I looked up peak time with additional details on TimeandDate.com and the location in the sky with Stellarium. For meteor showers in future years, look up the same information. Here is some information on upcoming meteor showers with good viewing conditions when the moon is not full. Perseids occurs from July 17 to August 24th. The peak night is August 12-13, 2018 and has a high rate of meteors. The peak is August 13th at 01h UTC. The crescent moon phase of 3% visibility allows for a dark sky and near perfect moon conditions! Plus it will set below the horizon before the peak hour. The Milky Way will be present in the sky too. Meteors will radiate from the constellation Perseus so look to the northeast for the radiant point. There is good viewing in both northern and southern hemispheres. This is an excellent meteor shower to photograph this year! Leonids occurs November 5 to 30th with the peak night November 17-18, 2018. The peak hour is November 17 at 23h UTC. The moon phase is 62% and the moon will be bright. However, photography is acceptable, though not ideal, after moonset. Meteors are strong around the pre-dawn hours when the moon will have set, allowing for better photographing conditions. The Leonids meteors are high in the sky, so look up and to the north. A vertical composition will increase chances of capturing meteors in the frame. Look to the constellation Leo the Lion for the meteors to radiate from. It is visible in both the northern and southern hemispheres. This is a good meteor shower for photographers this year. Geminids on the peak night of December 13-14th, will have a peak hour on December 14th at 13h UCT. It has a very high rate of meteors. The moon phase is 35% visible surface and this will provide some light on the landscape while still having meteors visible and photographable. Consider composing opposite the moon to get the moonlit landscape or sidelight from the moon by photographing with the moon just out of the frame. See my article Photographing the Moon for more information. Look to the constellation Gemini to the south. It is visible in the northern hemisphere and less so in the southern hemisphere. This is another excellent shower to photograph this year! Meteor Shower Composite with Milky Way and Fireballs – On the peak night, I placed the Milky Way in the frame then photographed on time-lapse for six hours. I ended up with 24 meteors with a couple of fireballs, meteors brighter than magnitude of -4 or the planet Venus. To create the composite, I used the Photoshop method mentioned in this article. The meteors appear composited exactly as shot as they were not resized or repositioned. Photographed at f/1.4, 20 seconds, ISO 1600, EF 24mm f/1.4L II USM, Canon EOS 5D Mark II. Meteor showers have a strong Northern Hemisphere bias for good viewing. Some meteor showers I recommend for photographers with high hourly meteor rates in the northern hemisphere are Perseids, Gemimids and also Leonids even though they are high in the sky with fewer meteors. For really big meteors and fireballs, I like photographing the Perseids and Taurids, even though they have fewer meteors. 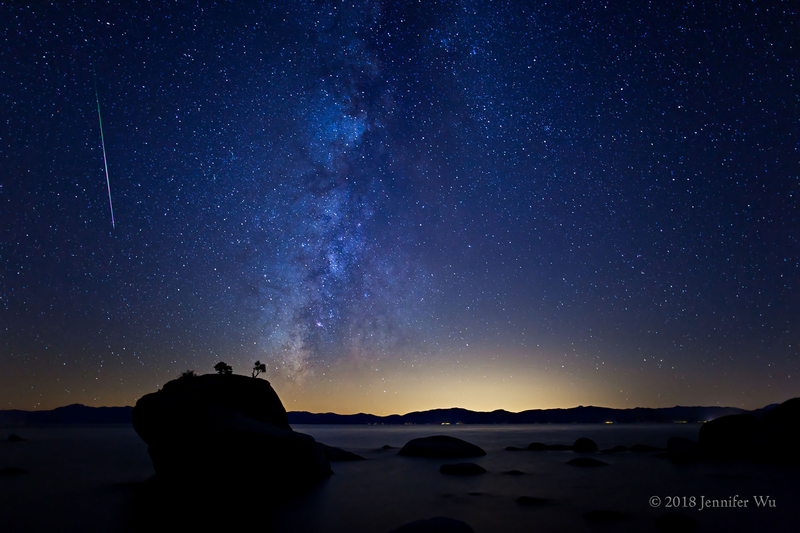 Meteor and the Milky Way over Lake Tahoe Vertical - There was a partial moon earlier in the night for this meteor shower, providing some light on the boulders and lake. f/1.4, 20 seconds, ISO 3200, EF 24mm f/1.4L II USM, Canon EOS-1D X.
Meteors can appear in any part of the sky, including near the horizon or looking directly above. Be prepared to photograph in all directions during a shower. However most originate from the constellation that the meteor shower is associated with. The meteors appear to radiate out from that point in the sky near the constellation—hence, it’s called the radiant point. If a meteor doesn’t radiate from that point, it is not a part of a meteor shower. As the constellation moves through the sky throughout the night, so will the radiant point. Once you get a couple of meteor shots, you can see where they radiate from and direction they point in the sky. Find the constellation the meteor shower is associated with in the sky on the night of the peak by using the apps listed. Set the time throughout the night to see its path during the night. Plan your shoot in any direction, knowing where meteors will radiate from. Often the constellation associated with a meteor shower is below the horizon line at sunset and will appear at some point during the night. Hence, the peak viewing start time is often later in the evening. The best viewing for most meteor showers is in the predawn hours. National and state parks usually provide dark skies with open views available. Look for a location higher in elevations for clearer skies. Check that your locations don’t get headlights that can light up your foreground and ruin your photograph. Scout your location before your shoot and compose with foreground in mind. 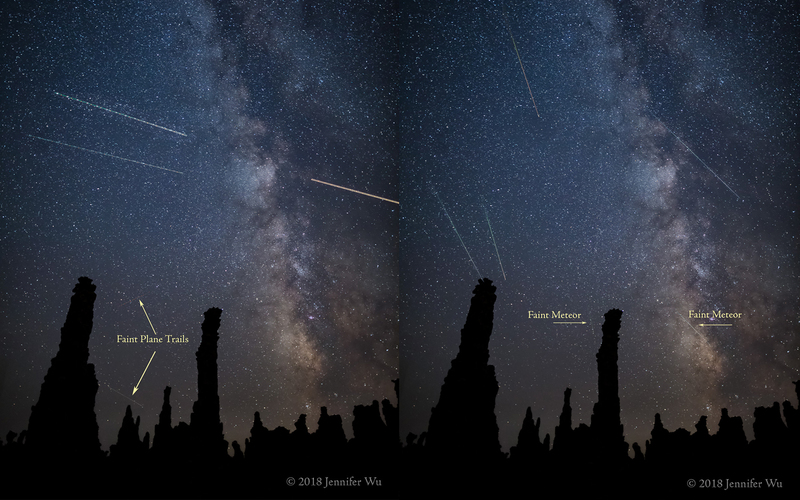 Perseids Meteor Shower Composite – I was able to capture a couple dozen meteors using time-lapse photography for about three hours of shooting time during the Perseids meteor shower. The meteors appear composited exactly as shot, radiating from the Perseus constellation to the northeast as it moved through the night. Images were not rotated to the radiant point. The trees were in silhouette for most of the photographs. However, for the base image I chose one where car lights lit the trees. Photographed at f/1.4, 20 seconds, ISO 2000, EF 24mm f/1.4L II USM, Canon EOS 5D Mark II. Perseus Radiant Path - Using the free app Stellarium, I set the location, date and time of the Perseids meteor shower in the above image to the Perseus constellation. It rises from the north to northeast and I pointed my camera in that direction. 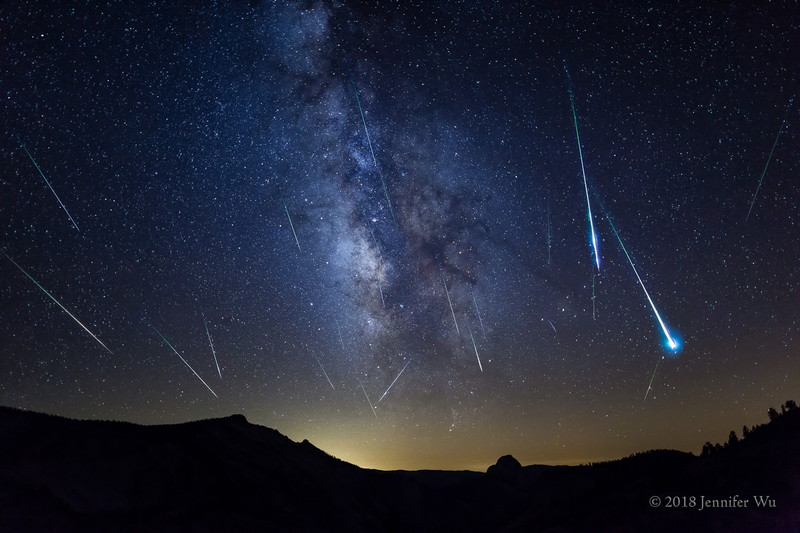 In the Perseids meteor shower composite, notice how the meteors radiate from the path of the Perseus constellation as it moved through the night. Click on your base layer and drag it to the bottom layer. Add a layer mask to the top meteor layer by clicking on the Add Layer Mask icon while holding the Alt/Opt key to hide the layer. Change the blend mode to “lighten” to allow the meteor to shine through and prevent dark sky areas from coming though. Remember the meteor location and paint in the meteor with a white brush at 100% opacity. (If needed, press the shift key and click on the layer mask icon to see the layer and hide it again.) Do this with all meteor layers for a beautiful meteor composite. Save your work as you go. Is that a Plane or a Meteor? Sometimes it is hard to tell if a streak across the sky is from a plane or a meteor and often workshop participants ask, “What is this?” Here is how what I look for. On Left: Plane Trails - This composite shows several types of plane trails taken on the same night. When reviewing your images, you can tell plane trails from meteors by looking at the color and how they start and end. The plane trails are often white or red with abrupt starting and ending points, not a tailored tip. Planes may have dotted lines of green or red, faint or strong. Use Photoshop to clone out unwanted plane trails using the clone stamp tool. 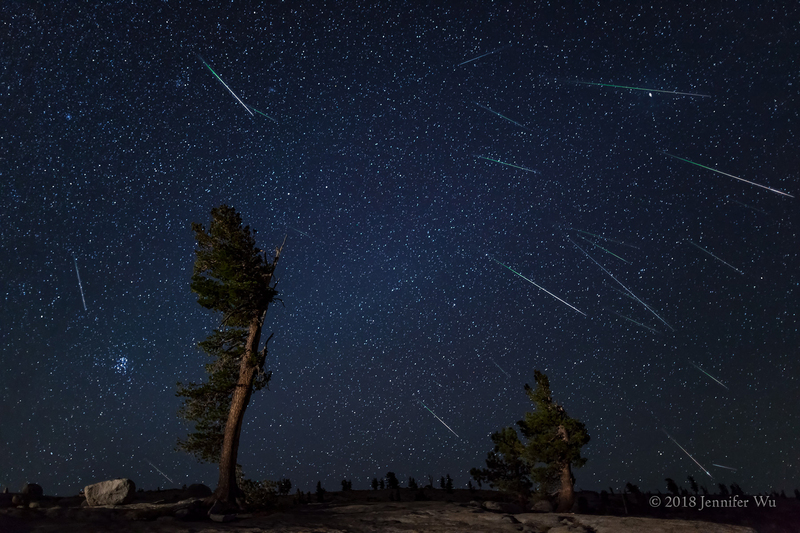 On Right: Meteors – This composite shows several meteors taken during a meteor shower. I noticed that meteors often start with a tapered green color, ending with a red or white tip. The meteor at the top of the frame starts green, turns yellow, then red or white at the base. Small meteors can look like planes. If you are unsure, review your image at 100% view — if the line starts abruptly, then it is a plane. If it starts with a green tapered tip, it is a meteor. Notice the difference between the faint green-colored meteors in this image versus the faint red and white plane trails of the image on the left. Remember to have a fully charged battery and an extra, if available, for doing time-lapse. If it is cold, keep the backup battery warm in your pocket to preserve the shooting time on the battery. Have plenty of memory cards if you are going to do continuous shooting. Use a small red flashlight or red headlamp to preserve your night vision. When in the dark our eyes adjust to being able to see in dim light. Using a common flashlight or headlamp with white light will significantly reduce your night vision. It can take 30 minutes or longer for the ability to see at night in dim light to return. Bring what you need to keep yourself comfortable including: warm clothes, insect repellant, water, food, and something to sit on, as the ground can be cold. 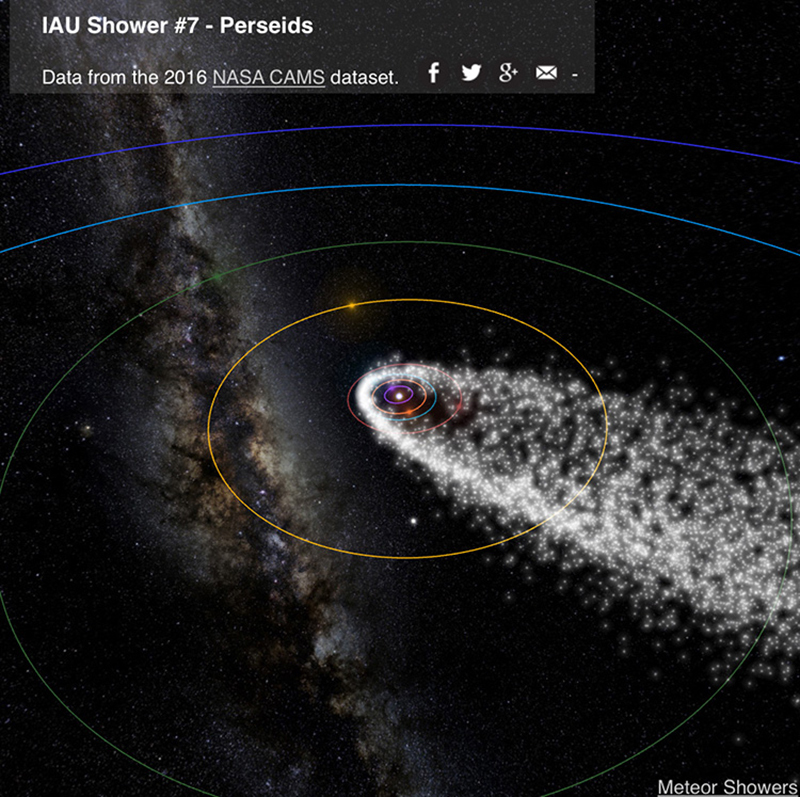 Perseids Meteor Shower - The interactive animation on this website shows the orbit and particles of the Comet 109P/Swift-Tuttle of the Perseids meteor shower, created by Ian Webster. Click and drag to change perspective. Check out additional meteor showers with the dropdown menu. Date from the 2016 NASA CAMS. Wishing you happy meteor showers and many wishes upon shooting stars! Meteor Shower Calendar: free app from Google Play/Android or iTunes/iOS.